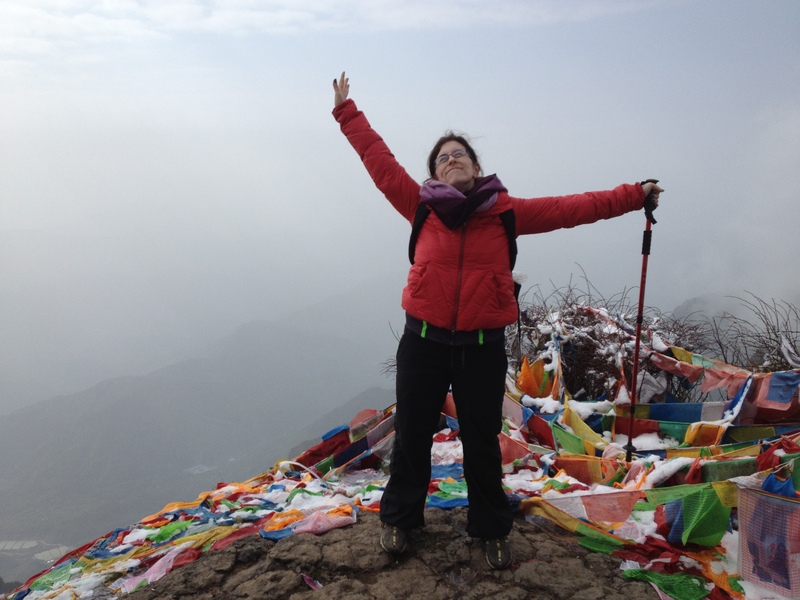 When I decided I wanted to get to the Golden Summit of Emeishan, I had it in my head that I could hike the whole way. I’ve never been good at judging distances, so ten-thousand feet sounded daunting, but entirely doable. 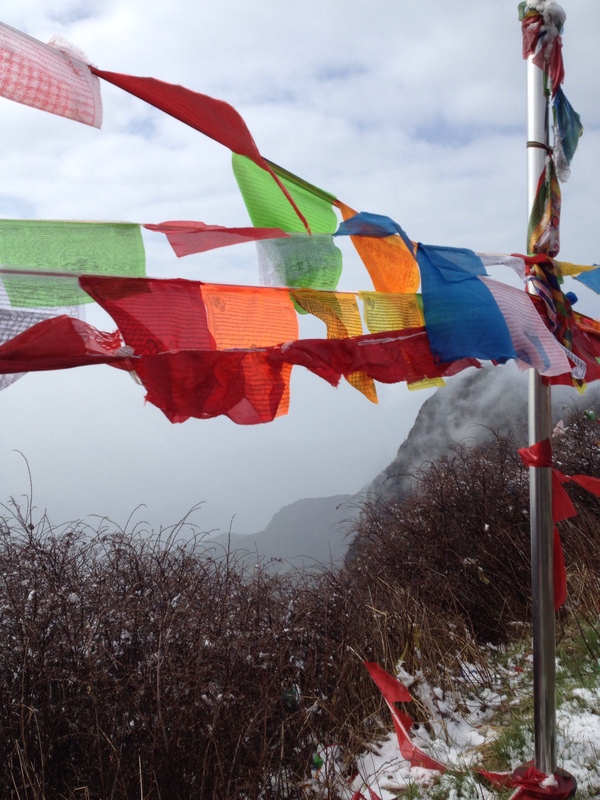 Over a full weekend – two days, with the idea I’d sleep in one of the monasteries along the way. Then I modified my desire – I wanted to see the sunrise on Golden Summit. It’s supposed to be one of the unparalleled sights in China. This meant getting to the top by Day 1, in theory, or close. I started at the bottom of the mountain both days. Grudgingly, I admitted I couldn’t climb ten-thousand feet in a couple of hours, and paid to take a bus. Now I’m up in the dark, groggily pulling on clothes and grabbing my two coats. I wait for Vega for fifteen minutes, until I worry about missing the bus and have to leave him behind (to my credit, I called, texted, and knocked at his door). I feel a little bad about it, but just a little. I was very, very clear about my plan after all. The sun will not wait for me. Neither will it wait for smokers. Want to see Jean get cartoon angry? Give her sore legs, a very lofty goal with a strict timer, have people grab her into lines and onto a bus like she’s a suitcase (much easier to pull than try and communicate) and then make her sit through someone’s smoke break. I swear to God, I thought I was going to lose it. The bus was making decent time – the light is growing quickly, but it’s just that pale blue of the potential sun. Then, twenty minutes in, we stop. I think maybe we have to switch buses, but no – outside the men are smoking, the old people are buying cup-a-noodles and steamed corn cobs. Twenty minutes in, and we’re taking a break?! But – the sun! The sun is on a faster schedule! I will not watch the sun rise over this ugly little strip mall on the mountain! We’re off again, careening up the mountain. My ears pop – we’re climbing fast, but so is the light. I can make out individual leaves and trees now. The grey is turning blue. Up and up we go. And when we get to the bus stop, I can see the peak. It’s another thousand feet up – I can see the steep cable cars mounting the distance. And the loading area is packed with people. Tour guides scream into megaphones, a man lights a cigarette at my shoulder, and everyone is funneling to a single set of stairs. Sometimes I wonder what my version of Hell would be like. I think this would be part of it – the horrid realization that getting up before dawn to see something will not only not yield what I want, but that all the normal hazards of Chinese tourism apply. I let myself get surged forward, souring in temperament further as people spit and smoke. Then I see a woman stop, and have to be taken off the path. Soon I see another person, squatting near a building. I hear it in the breathing of those around me – wheezing and coughing, labored inhalations. We’re around 9000 feet up – the air is a little thinner, and altitude sickness is not to be taken lightly. Oh, I shouldn’t have felt so sanctimonious, but as a man blows cigarette smoke in my face, clears his throat and spits in front of my feet, then starts wheezing in the cold mountain air, I do. Up we climb, the mass of people. I am working hard to be in better spirits. After I get away from the smokers a little, the air is magnificent. It’s crisp, clean, and cold. I’m glad for my heavy coat. And the sun is up, but only just, and it illuminates the cliffs and ledges around me. I am glad to be there, to see it. There is something awe-inspiring about the sun and heights. They go together in a way that makes men and women pray. As the monks are doing here as they walk. Vega finds me at the cable cars, still pulling out of a sour spiral. We get tickets for the cable car, and I direct him to the smaller, perpetually moving cars. They seat six to a car, and are a little terrifying. But not, I reason, as scary as the single car, which carries one hundred people and boasts of being “the longest cable suspension system without a support pillar.” Yeah, I like support pillars. And the climb is steep. We’re all a little frightened as the car shudders at each transitional support beam. I distract myself by debating where would be the best place for the cable to break – the nuts and bolts of certain death. At the top, there is more climbing. I will not be resentful – it’s too cold and wonderful. Vega is amazed by the snow, but I can’t be. Having just survived the Polar Vortex in Chicago, I look at the snow as a nice decorative element. And it’s already starting to melt in the morning glow. 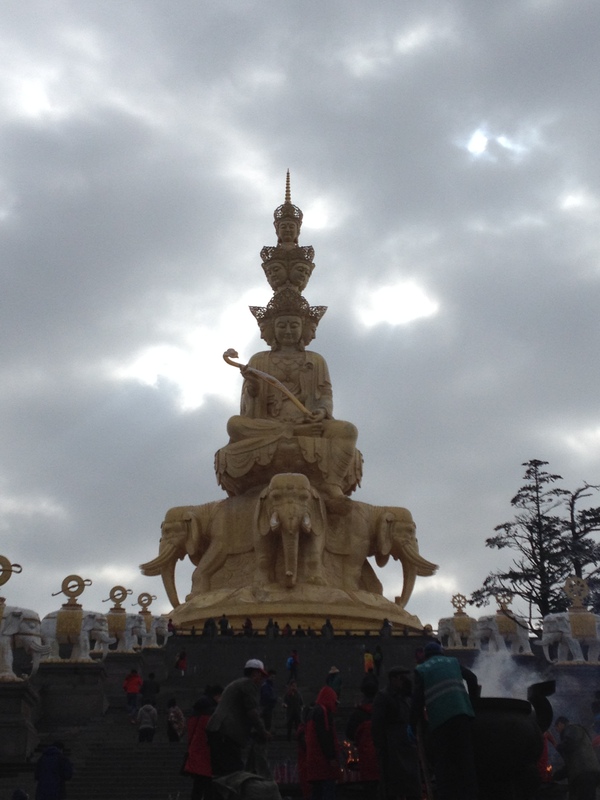 Suddenly, I see it –the Buddha on the Golden Summit. Or one of the heads of the Buddha. Rounding a bend, I catch my breath. Absolutely incredible – the scope of it was a perfect match for the location. Majesty would be a good word. 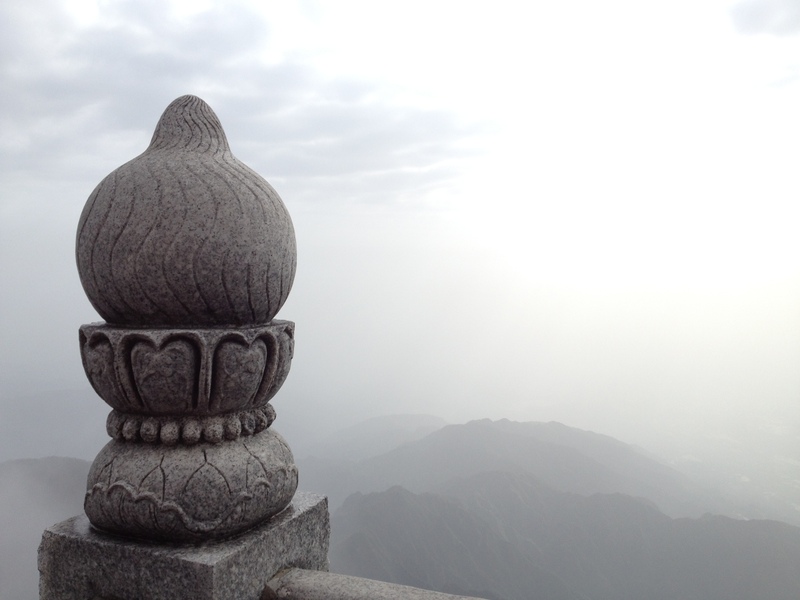 This is what you build on the top of a mountain – this statue, and the temples surrounding it. This monument to the sky – I can feel the significance and power of the place, which settles deeper than the tour groups can hope to overcome, try as they might. I climb the last flights of stairs behind the Buddha, and then there are to more steps. I am on the summit. I feel my face relax into a smile as I go to the ledge to look over the mountains. It’s breathtaking, sunrise or no. I can go no higher, and it’s the best feeling I’ve had in a while. It’s completion and satisfaction, coupled with admiration and delight. I break out a celebratory Snickers, saved for just this moment. I should have waited till I was alone – Vega has been eating my trail food (he would continue to all day), since all he brought was a hoodie and some misplaced Pokemon cards in his backpack. He asks if he can have some. In the spirit of giving and being a decent person, I reluctantly share my Bar of Satisfaction with him. I walk around the site, basking in the morning glow. Children are building a snowman with what melting snow is left. Men are smoking, and being chastised for doing so by the women with them. I light candles and incense for my family, and pray. I feel slightly awkward. While I like to think that Jesus and the Buddha hang out all the time, I’m not sure if God would want me talking to strangers, as it were. So I pray to my God, which also feels strange because I’m not at a Christian shrine. So then I awkwardly ask Buddha if he can do what he does as well. I don’t know any prayers to Buddha specifically. It’s so much easier to pray to spirits and deities of specific qualities – you just ask for those qualities. Since I’m already grappling with faith problems, feeling out of place is not new to me. My hope is that if a deity was listening, that they would take care of my family. Still, I felt like a faith switchboard operator. After basking and walking and basking some more, we start our descent. Two female monks pass us. They’re dressed in grey shirts and pants, and they’re wearing thick gardening gloves and knee pads. Every three steps, they stop, kneel down, and put their heads to the ground. Heads shaved, I would not have known they were women, save for Vega pointing it out. Emeishan was, in its time, a sanctuary for female monks. It’s steep and long and I don’t know why I didn’t just take the cable car back down, except perhaps to save the money and spend more time on the mountain. Do my time, though my calves genuinely hurt and wish I wouldn’t. 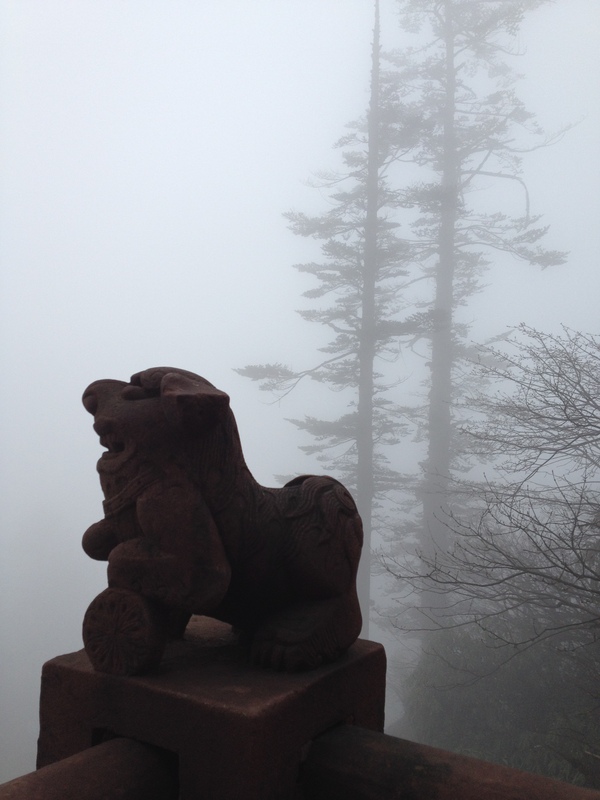 The clouds move in, and we’re so high they blanket our walk in damp and fog. It’s nice, in its way. And there aren’t many people on the steps – it’s a long, difficult trek down. I can imagine what it’s like trying to climb the thousand feet up, with steps that are so steep and few platforms to rest. Still, we make it down. I’m wobbly. We hop on a bus, which gets us back to the main bus terminal. Bill and Sam are somewhere behind us, so we stop to get some dim sum. Except it’s not – every time I say I want small dishes, I invariably get full meals. I would be happy with dumplings and rice balls, but my translators seem to think I don’t know my own language. It’s good though, so I can’t complain too loudly. My legs can. That night, after the three hours in the car back to the hotel, my legs cramp up. It’s bad – I can’t touch roll my feet without wincing. I tried stretching them in the car. I knew that it wouldn’t be good to work them and then sit them for three hours without a cool down, but I don’t do enough. I feel like my legs have shrunk a few inches, and I limp to my room. 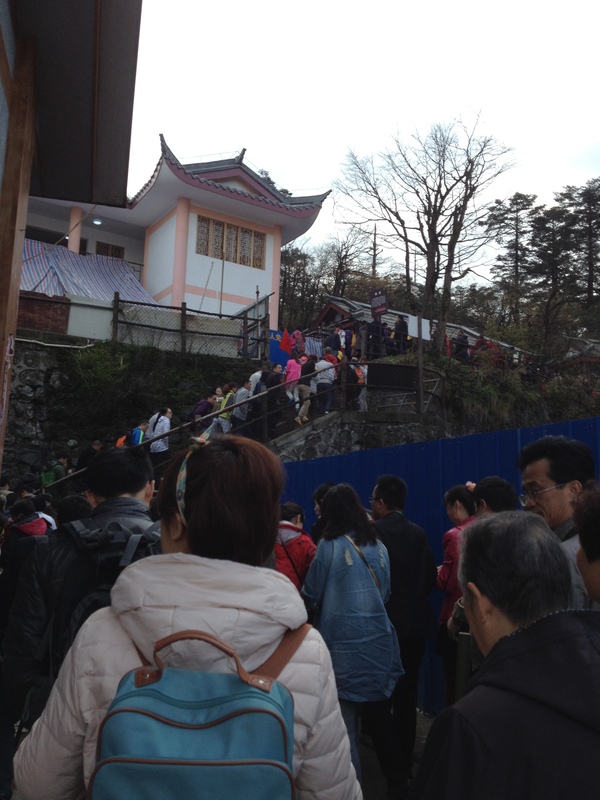 This Post was posted in Places, Travel and tagged Buddha, Climbing, Crowds, Emei Mountain, Emeishan, Hiking, Majesty, Prayer, Travel in China, Traveling Abroad. Bookmark the permalink. Hi, thank you for taking the time to stop by and follow my blog, I hope you enjoy reading it. I really appreciate it. Just about to take a look around your site, it looks great! Thanks again.